Home » Inspiration & Advice » How to update your home with an accent of ‘Blush’! How to update your home with an accent of ‘Blush’! This season we are loving the ‘blush’ colour trend, and are getting behind the colour hue wholeheartedly. It is so soft, feminine and romantic yet brings an air of lightness and freshness to a room. It brightens up grey in a subtle way and adds interest and softness to a room. Accent a wall with Old Rose Paint from Neptune. 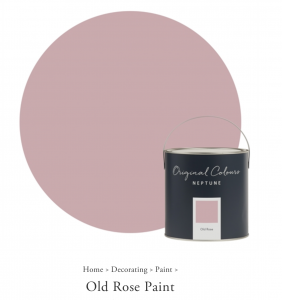 The inspiration for this colour lies in nature, and comes from the slightly fading petals of a classic English rose. It makes a room feel calm and very welcoming. 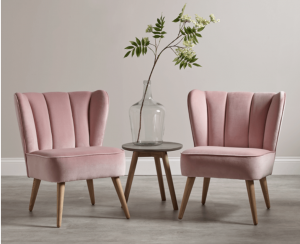 We love the new Wesbury Velvet Chair from Cox and Cox in blush bringing subtle colour into a room with neutral or grey walls. 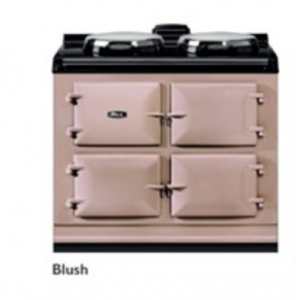 And we absolutely adore the new Blush Aga Colour! This works fantastically well in a kitchen with neutral, grey or white cupboards to add interest, warmth and romance. Blush works beautifully with natural green so you can accent your kitchen with herbs and plants to bring an element of nature into the room. Complement these accents with a blush curtain pole to complete the look. We love the wooden Blush Seychelles curtain pole Handcrafted by Jones Interiors. Available in a 40mm diameter it is a perfect diameter to be noticed, yet isn’t too large to imbalance a room. The paint has a contemporary matt finish and there is a choice of 6 different finial styles available. These poles are hand painted and hand finished by Jones’ experienced craftsmen in their workshop in Nottingham. We also love the Jones Interiors 35mm Strand painted ball metal curtain pole with heather painted finials. These look fantastic on the metal poles and really make a statement. The ball finials are a perfect size to make a statement and create the “wow” factor at your window. The Heather painted ball accents the ‘blush’ trend beautifully and the rose gold curtain pole also picks up on the rose gold / copper trend we have seen over the last couple of years (pictured on the left). The painted balls are also available on a matt nickel, chrome (shown here on the right) or black nickel pole and are available with or without rings should you have eyelet curtains. There are also 3 types of brackets available to suit your requirements. If you have eyelet curtains we would recommend you choose the 11cm brackets as this brings the curtains further away from the wall to allows for the eyelet curves. 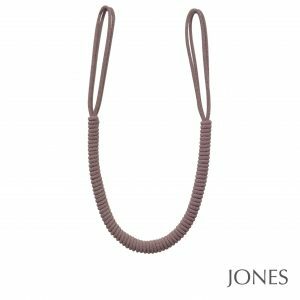 We are obsessed with attention to detail and these Lustre tieband embrace by Jones Interiors will add the finishing touch to your room (shown here in Heather) £9.95 each. Finally if you’d like your curtain pole to match a particular paint colour why not get it painted to match! It works really well to match your curtain pole to an accent wall colour. We offer a Bespoke Paint Service. Simply choose any of the Jones Interiors Hand Crafted curtain poles and we can paint any of these poles to a colour reference of your choice. Please call us on 01625 449039 if you’d like any further information on this service.